Power on and button test only, no software or data cable included, as we have no software or data connection the printing function remains untested. FARGO DTC1500 Dual Side ID Card Printer (P/N 051405). Complete Dual Side ID Card Printer Kit Photo ID Card Printer. Printer Driver : Windows® XP / Vista™ / Server 2003 & 2008 / Windows® 7 / Windows® 8 (32 bit & 64 bit) / MAC OS X 10.5/10.6/10.7/10.8/10.9/ Linux (Available Soon). FARGO DTC1250e Single Side ID Card Printer (P/N 050000). Starter Single Side ID Card Printer Kit Starter Photo ID Card Printer Systems Kit. Printer Driver :Windows® XP / Vista™ / Server 2003 & 2008 / Windows® 7 / Windows® 8 (32 bit & 64 bit) / MAC OS X 10.5/10.6/10.7/10.8/10.9/ Linux (Available Soon). FARGO DTC1250e Single Side ID Card Printer (P/N 050000). Starter Single Side ID Card Printer Kit Starter Photo ID Card Printer Systems Kit. Printer Driver : Windows® XP / Vista™ / Server 2003 & 2008 / Windows® 7 / Windows® 8 (32 bit & 64 bit) / MAC OS X 10.5/10.6/10.7/10.8/10.9/ Linux (Available Soon). 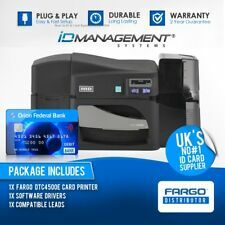 FARGO DTC4250e Dual Side ID Card Printer (P/N 052100). Dual Side ID Card Printer Kit Photo ID Card Printer Systems Kit. Printer Driver :Windows® XP / Vista™ / Server 2003 & 2008 / Windows® 7 / Windows® 8 (32 bit & 64 bit) / MAC OS X 10.5/10.6/10.7/10.8/10.9/ Linux (Available Soon). The Printer is in excellent near new condition. FARGO DTC1250e Dual Side ID Card Printer (P/N 051000). Photo ID Card Printer Systems Kit. Printer Driver :Windows® XP / Vista™ / Server 2003 & 2008 / Windows® 7 / Windows® 8 (32 bit & 64 bit) / MAC OS X 10.5/10.6/10.7/10.8/10.9/ Linux (Available Soon). 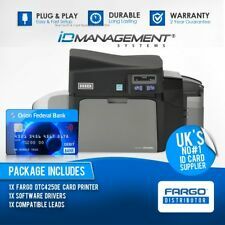 FARGO DTC4250e Dual Side ID Card Printer (P/N 052100). 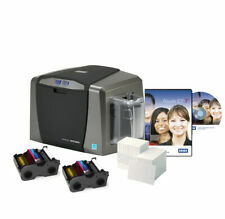 Starter Photo ID Card Printer Bundle. Printer Driver : Windows® XP / Vista™ / Server 2003 & 2008 / Windows® 7 / Windows® 8 (32 bit & 64 bit) / MAC OS X 10.5/10.6/10.7/10.8/10.9/ Linux (Available Soon). It's designed for everyone who wants to make great-looking plastic ID cards - even technology cards - on a budget. Specially designed for mid-sized card programs, the Fargo DTC4250e single sided ID card printer can produce full color cards in just seconds. HID Fargo DTC300 Photo ID Card Thermal Printer / Encoder System. FARGO DTC4250e Single Side ID Card Printer (P/N 052000). Single Side ID Card Printer Kit Photo ID Card Printer Systems Kit. Printer Driver :Windows® XP / Vista™ / Server 2003 & 2008 / Windows® 7 / Windows® 8 (32 bit & 64 bit) / MAC OS X 10.5/10.6/10.7/10.8/10.9/ Linux (Available Soon). If you're looking for fast print speed without compromising quality, the HID Fargo DTC1250e Dual-Sided Printer, is the fastest printer in its class! FARGO DTC1250e Dual Side ID Card Printer (P/N 051000). FARGO DTC4250e Single Side ID Card Printer (P/N 052000). 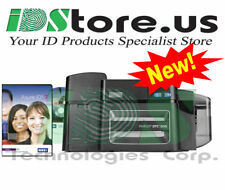 Complete Single Side ID Card Printer Kit Complete Photo ID Card Printer Systems Kit. Printer Driver : Windows® XP / Vista™ / Server 2003 & 2008 / Windows® 7 / Windows® 8 (32 bit & 64 bit) / MAC OS X 10.5/10.6/10.7/10.8/10.9/ Linux (Available Soon). The FargoHDP5000 DoubleSided Printeris a high-end printer capable of printing thousands of cards with extra reliability. -USB & Ethernet port connections. Our ID experts are ready to tackle any photo ID or plastic card printing challenge! 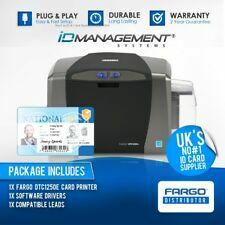 This ID card printer even has an Ethernet and USB connection built in to give users access to a network of devices in order to quickly and efficiently print out cards. The Fargo thermal printer is a quality ID card production printer option. Puerto Rico or Virgin Islands. Condition: New Open Box! Sold As Pictured! The order cannot be combined or modified after checkout has been completed. checkout before your order will be cancelled. HID® FARGO® DTC4000 Card Printer/Encoder. DTC4000 is turned on and off using the power button versus plugging in the power. power consumption when in standby or sleep mode. Dual-Input Card Hopper (200 cards) - Upgradable. Printer has new print head installed. Actual Picture of the item is provided. What you see in the picture(s) is what you get. A key feature of the DTC550 is that it plays well with everything else on your network. The DTC550 connects to your Windows - based PC through its USB port. It can also be added to your network as easily as any workgroup printer. Fargo DTC1000 Double Sided Duplex Color ID Card Printer. Tested and in Great condition. There are a few scratches on the back side. Printer and charger only. Shipping price include insurance and signature confirmation. Shipping only within the lower 48 states only. If returned for any reason, buyer MUST pay return shipping. Buyer must have a rating of at least 10 or more. Payment due within 24 house of sale. Inventory ID: D36-28. Hours of Operation. Our 30,000 Sq.Ft. Fargo DTC550 main board D000367 A000116. WHAT'S INCLUDED. I am not responsible for the wrongful use of this machine or any issues with it that may result in a non 100% functional item. 1- That you have knowledge of how this Item/Machine works and can use itAS IS. Up for sale used working Fargo 85600 Printhead for Fargo DTC525, DTC520, DTC510, DTC515 ID Card Printers /. This printer is virtually maintenancefree and prints full-color, plastic ID and technology cards on a budget. Model : DTC1250e. dye sublimation/thermal resin. Printing Technology : Dye sublimation/thermal resin. This item is Being Sold in AS IS condition and as seen in the picture. we can give. page may be partial, or incomplete but we do our best to provide the most accurate information. Fargo 50130 DTC1250e Dual-Sided Card Printer + Magnetic Encoding & Ethernet NEW! Fargo DTC1250e Dual Sided, Magnetic Encoder, USB and Ethernet. With an internal print server for secure printing and a magnetic stripe encoder, the versatileFargo DTC1250e Dual-Sided ID Card Printer is a well-featured printer that utilizes dye sublimation and resin thermal transfer processes to quickly create 300 dpi resolution prints. Fargo DTC1250e Single Sided Color 300dpi USB Ethernet ID Card Printer 050020. Manufacturer Fargo. -One (1) Fargo DTC1250e Single Sided Color 300dpi USB Ethernet ID Card Printer 050020. -Single Sided. -ID Card Printer. The Fargo DTC4250e direct-to-card printer is ideal for applications with low to high security needs. The Fargo DTC4250e dual-sided card printer prints 225 full color dual-sided cards per hour and 150 full color single-sided cards per hour. Fargo DTC1500 Color ID Card Printer, Dual-Sided Printing, 32MB RAM, USB 2.0 and Ethernet with Internal Print Server Interface. Provides organizations with a high-performance, energy-efficient photo ID printing solution that supports corporate sustainability initiatives while reducing costs. Card Printer Ribbons. Printer Display: User friendly, SmartScreen graphical display. WE ARE THE UK's NUMBER ONE SUPPLIER! Printing Specifications Printing Speed: Full colour - 24 seconds. Card Printers. Produce 50% more cards than other printers in its class with the Fargo DTC1250e. This is the single-sided model only but is also available as a dual-sided option. Card Hopper Capacity: 100 card input, up to 30 card output. Card Capacity: Up to 200 cards input; 100 card output with 100 card reject hopper capacity. It can print professional quality colour prints, encode and laminate with a fast print speed. Keeping your printer and the cards clean will enhance your print and prolong the life of your printer. Produce 50% more cards than other printers in its class with the Fargo DTC1250e. This is the dual-sided model but is also available as a single-sided option. Card Printer Ribbons. Printer Display: Colour changing status buttons. The Fargo DTC4250e single-sided card printer prints 225 full colour single-sided cards per hour - 50% faster than its predecessor. This printer is also available as a dual-sided printing model. Card Printer Ribbons. Model DTC550. This printhead is in good condition with minor wear but nothing that interferes with normal operation. The mounting screw is not included with these printheads. Printer Compatability: Fargo / HID DTC 550. Buy Fargo DTC4250e Single-Sided ID Card Printer with Ethernet, Internal Print Server, & USB Review Fargo DTC4250E. Paper Capacity Input Hopper Card Capacity: Up to 100 cards with 30 mil (0.762 mm) thickness Output Hopper Card Capacity: Up to 100 cards with 30 mil (0.762 mm) thickness. Model DTC1000. This printer is virtually maintenance-free and prints full-color plastic ID and technology cards on a budget. The DTC1000 adds a level of convenience to easily print what you need, including. The FARGO® DTC4500e is an easy to use printer. It has an easy and efficient setup, coupled with the loading of printer ribbon which is also very easy. The printer ribbons used with the DTC4500e printer are economical and eco-friendly so that you can help save the world while you save your organisation's ID problems. Unless otherwise stated, product manuals, software drivers, PC connection cables or other accessories are not included. Software drivers can be downloaded for free from the respective manufacturer pages. This printhead is in good condition with minor wear but nothing that interferes with normal operation. Printer Compatability: Fargo / HID DTC 550. Product Line Fargo DTC. Printer Type ID Card Printer.